Roberts, John Maddox. Hannibal's Children . Ace 2002. What if: Hannibal convinced ally Philip V of Macedon to actually provide troops for his assault on Rome, creating an overwhelming force against which the Romans could not hope to stand. Offered total destruction or "national exile", the leaders of Rome chose the latter and established Roma Noricum along the Danube. 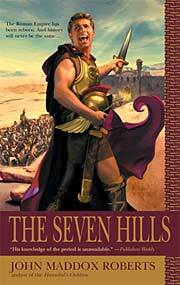 Series note: Series including just Hannibal's Children and The Seven Hills , but which seems incomplete. Summary: More than a century after their exile, Rome sends a mission south over the Alps to scout in preparation for possible reconquest of the homeland. They discover Italy undefended, Carthage preparing for war against Egypt, and Carthage's own rulers intriguing against one another. 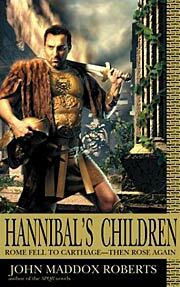 Series note: First of the Hannibal's Children series. Published: Ace 2002 (0441009336BUY), 2003 (0441010385BUY). Roberts, John Maddox. The Seven Hills . Ace 2005. Summary: As the new war between Rome and Carthage begins, one of Rome's generals leads his legions on a great circumambulation of the Mediterranean, amassing much treasure as they go, while another dallies in Alexandria with machine-making philosophers. Series note: Second of the Hannibal's Children series. Published: Ace 2005 (0441012450BUY), 2006 (0441013805BUY).